Yes! I travel for weddings and sessions. Please contact me and we can put together a custom package to fit your needs. Congratulations on your engagement! I would love to hear how you and your fiancée met and your engagement story. Let's discuss your wedding day over a cup of coffee and get to know each other. A lifestyle portrati session fee is $125. All prints can be purchases ala carte and require a minimum of a $200 print order. Digital packages start at $500. PORTRAITS - Every family is beautiful and has a special and unique story to tell. One of my favorite things is to catch the laughter of a child or a special glance between two people madly in love. I want to capture and preserve your memories for you. Wedding day coverage starts at $2,250. All weddings include 6 hours of coverage, a DVD with edited high-resolution images from your wedding day and a complimentary engagement session. 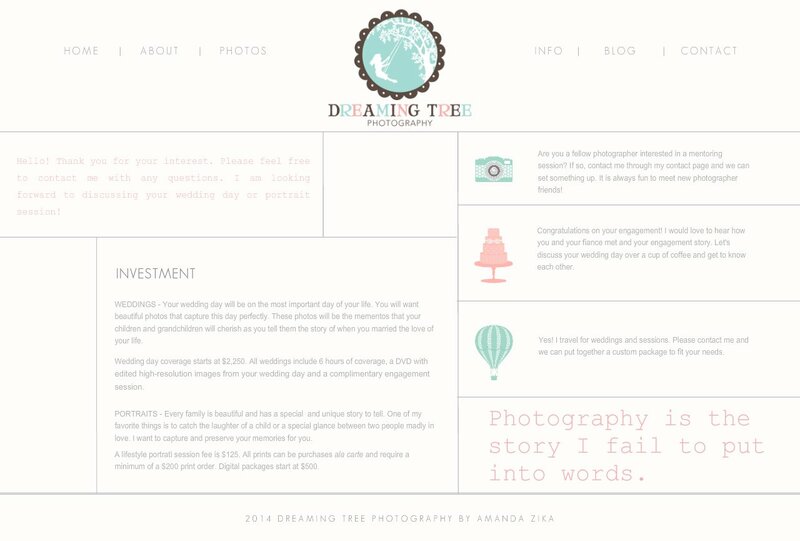 Are you a fellow photographer interested in a mentoring session? If so, contact me through my contact page and we can set something up. It is always fun to meet new photographer friends! WEDDINGS - Your wedding day will be on the most important day of your life. You will want beautiful photos that capture this day perfectly. These photos will be the mementos that your children and grandchildren will cherish as you tell them the story of when you married the love of your life. Hello! Thank you for your interest. Please feel free to contact me with any questions. I am looking forward to discussing your wedding day or portrait session!